In a saucepan over low heat melt butter and marshmallows. Stirring constantly until smooth. Stir in vanilla. Pour over popped pop corn and mix until well coated. Make one large ball for the bottom, one medium ball and a smaller ball for the head. Decorate with pretzel sticks, candy, raisins, or nuts for the eyes, nose, mouth and buttons. Prepare a cake mix and bake in two round cake pans. One cake pan smaller than the other. One will be the bottom of the snowman one will be the top. Allow to cool and frost with white frosting. If desired, sprinkle shredded white coconut over all of frosting or leave without. Add gumdrops or other candies for eyes and a nose and licorice whips for a smile. Add chocolate candies for buttons. You can add pretzels rods or licorice whips for arms. Click here for original Flickr recipe and photo. Start out with two or three scoops of vanilla ice cream. Have the kids decorate their snowmen with M&Ms for the nose and chocolate chips for the buttons and the eyes, long pieces of black licorice could be used for the top hat. 1. Line a baking sheet with waxed paper and coat with nonstick cooking spray. 2. Melt the butter in a soup pot over low heat. Add the marshmallows and stir until melted. Remove from the heat and add the cereal; stir until completely coated. 3. Using a 3/4-cup measure of the mixture for each, form five balls and place on the baking sheet. Using a 1/3-cup measure for each, form five more balls. Place the smaller balls on top of the larger ones, forming snowmen. Decorate with the candies, chips, and pretzels as shown. 4. Serve, or cover loosely with plastic wrap until ready to serve. TIP: Coat your hands with nonstick cooking spray or butter to keep the marshmallow mixture from sticking to them when forming the cereal balls. For best results, use fresh marshmallows. 1 jar (7 oz.) marshmallow creme can be substituted for marshmallows.Diet, reduced calorie or tub margarine is not recommended. Store no more than two days in airtight container. Using buttered spatula or waxed paper, press mixture evenly in 15 1/2 x 10 1/2 x 1-inch pan coated with cooking spray. 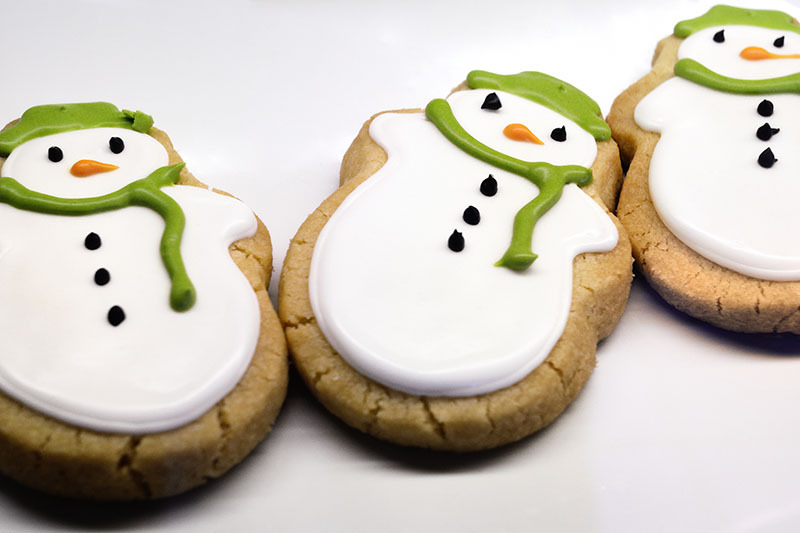 Using a 4-inch snowman cookie cutter, cut into snowman shapes when cooled. If a snowman cookie cutter is not available, use 1 1/2-inch, 1 3/5-inch and 2-inch round cookie cutters. 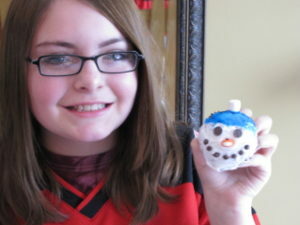 Using prepared frosting, connect each circle to make a snowman and decorate as desired with remaining ingredients. Best if served the same day. For each Snowman use one large, one medium, and one small piece of banana. Stir honey into the milk and then dip the pieces of banana into the minture. Mix eggs, butter and vanilla. Slowly mix in cake mix. Roll dough into one inch and 3/4 inch balls. Put smaller ball beside larger ball on cookie sheet, press together slightly. Use green candy for eyes on smaller ball; use red candy on larger ball for buttons. Bake at 350 degrees on a ungreased cookie sheet, for 8-9 minutes. Remove and cool. Use red icing gel to make mouth and brown to make a broom. BASIC RECIPE: Give each child 2 marshmallows, 3 pretzel sticks and a few raisins. Take a pretzel stick and put it into the middle of one of the marshmallows and then place the other marshmallow on top. Now take the other two pretzels and use them for the arms. Use the raisins for eyes, nose, and mouth. Make toasted bread; make circles from the toast using the cookie cutters. Spread cream cheese on the toast to create the snow. Decorate the ‘Snowman” with the carrots and raisins. Fashion a scarf with thin strips of the fruit roll-up. Fun! Give each child a rice cake and have them spread cream cheese or white frosting on the rice cakes. Decorate the faces with M&M’s, raisins, raisenettes, red liquorish, and baby carrots. These are easy and fun! Simply dab a bit of white frosting to a candy corn and place it in the center of the donut (where the hole is)…This sample (made by kids as well as the below snowman) has regular chocolate chips for the eyes and mini chocolate chips for the mouth. Trimming choices: Candy corn, M&M’s, mini M&M’s, chocolate chips, mini-chocolate chips, etc. 1. In this sample…two donut holes are joined together by a toothpick and secured on a mini powdered sugar donut. (You can use one donut hole on one donut if desired… and then preceed with the same directions). The head is topped first with a round pretzel and then an unwrapped candy kiss to make a hat. 2. The eyes and buttons are chocolate chips. The nose is a candy corn piece. There are no arms in this image. Ingredients: Both Large and Mini Marshmallows, Pretzel Sticks, Raisins, Small Candies and Chocolate chips– Frosting to use as a ‘Glue’. 1. Melt the chocolate bar in the microwave 15 seconds at a time until soft. 2. Using a paint brush–paint eyes, nose and mouth on the inside of the glass. 3. Put the glass in the refrigerator so the chocolate can harden. 4. Mix the ice cream, vanilla and milk together in a blender. Pour into the glasses. 5. Add ribbon or yarn to the base of the glass for a scarf. Enjoy your snowman! NOTE: I made this drink and you need to be very careful when painting on the face! Our ‘faces’ looked more like they were ready for Halloween (but still were yummy! )~ I now make orange shakes/smoothies with Jack-O-Lantern faces in October! 1. Place white chocolate chips and shortening in a medium microwave-safe bowl. Microwave on high for 1 minute; stir until chips are melted and mixture is smooth. If necessary, microwave on high for additional 30 second intervals until mixture is smooth. If you prefer, place in double boiler over low heat, stirring until completely melted and smooth. 2. Meanwhile, pierce 1 end of each cookie with a toothpick. Use the toothpick to dip entire cookie into the white chocolate mixture. Let excess drip back into bowl and lay cookie on wire rack. Before the white chocolate has a chance to cool, decorate the cookie with various candies into a playful snowman. 3. Place chocolate sprinkles as eyebrows, blue or green dots for eyes, an orange sprinkle placed vertically for the nose and several red nonpareils for a mouth. Cut a gumdrop in half, slice a sliver from each half lengthwise to form a crescent shaped brim to the hat. Top off the hat with a gumdrop half and reserve the other half for another snowman. You may have to flatten the gumdrop a bit to fit the snowman. HAVE FUN WITH OTHER WINTER PAGES!